Today I was back from three days away in San Diego. I got a chance to go to a conference where I could pitch my product to Wendy Robbins who is on HSN from time to time. I was a little disappointed because she didn't seem to like my cutting boards very much. She said they were not for HSN. I am still not so sure about that. She also suggested that I produce my boards overseas to which I actually said, "no no no, and no again." But I have to realize that my product is not a good fit for every brand. 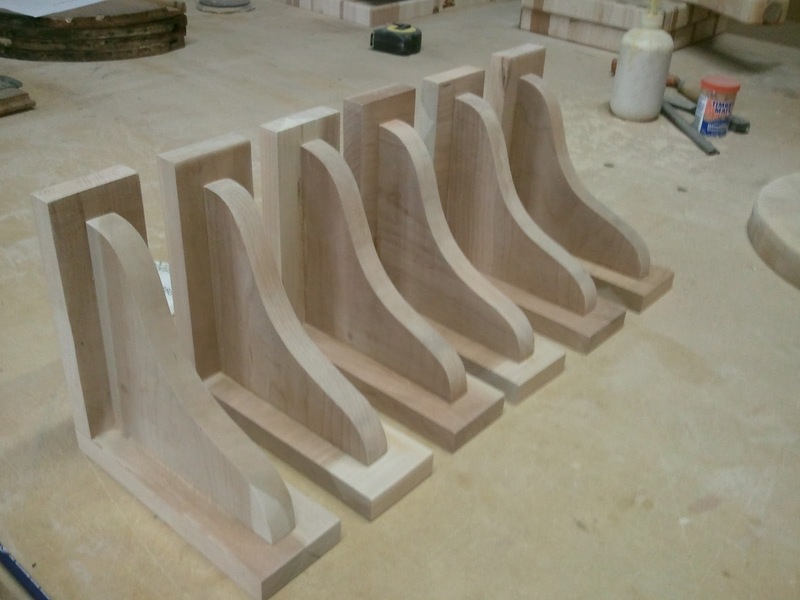 I get a call from Masco Cabinetry and they need me to make corbels, finish them, and get them done by Monday morning so they can finish a house for a walk through. For those of you who don't know what corbels are let me explain. They are the stabilizers or whatyoumacallits that go under your overhanging countertop for stability. Anyway, my dad was out on a job and he obviously couldn't make the corbels so I had to look at myself and say; "Self are you going to try to build these corbels?" Oh yes I am!!! 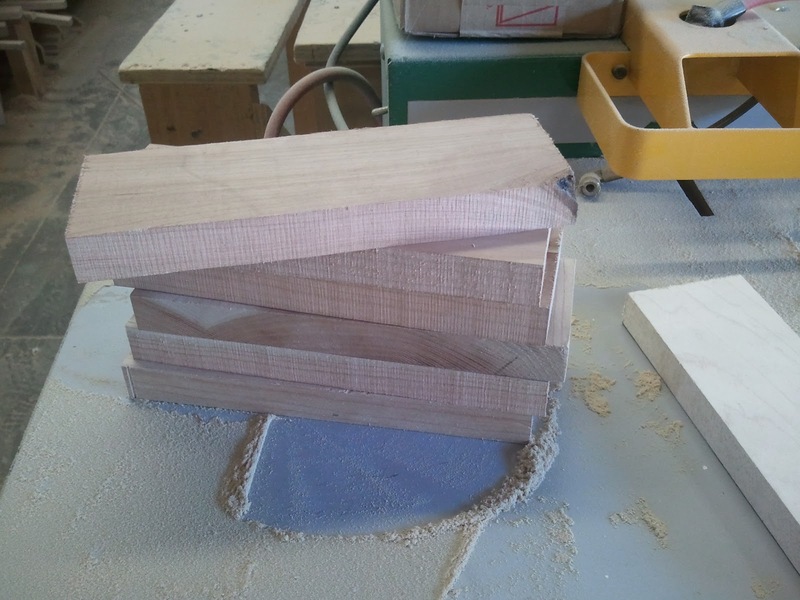 So I had to find a corbel that was already made in the size I needed and get to work. I needed to find out the sizes I would have to cut the pieces in order to put them together. And YES I DID USE A SAW! A band saw, but nonetheless a SAW. 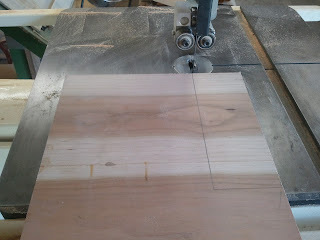 This picture shows the pattern of one of the pieces I traced and then cut out. I know it is so corny how excited I get about doing something new but that's me. I used to always be so excited when I could order root beer. I LOVE root beer. Sorry off on a tangent so I had all the middle pieces cut already and all I had to do was cut 14 pieces for the backs of the corbels. This picture to the right is where I said; "holy crap" because I didn't realize there was a knot in the piece I was cutting out and after I set it down realized I couldn't use it. After sanding each piece and sanding some more I had to assemble all the corbels. Everything went together pretty good, I would have to say it took me waaay to long to do the entire process, but I know next time I will be more efficient. So these are my first ever corbels made by me, my labor of love. They are definitely not perfect and I had to learn without an instructor, just remembering my dad's advice when building something. Now all I have to do is convince Mr. Know-it-All that I need to go into work to finish them! That will be fun.